Saturday October 1st 1881 I was about home all the morning and in the afternoon went down to Beechers where I spent a pleasant afternoon and staid till nearly nine oclock when Will came for me. I had a long letter from Rob today. Sunday October 2nd 1881. It was a rainy gloomy day. I visited with Will most of the forenoon and after dinner washed, dressed and took a nap which rested me very much. 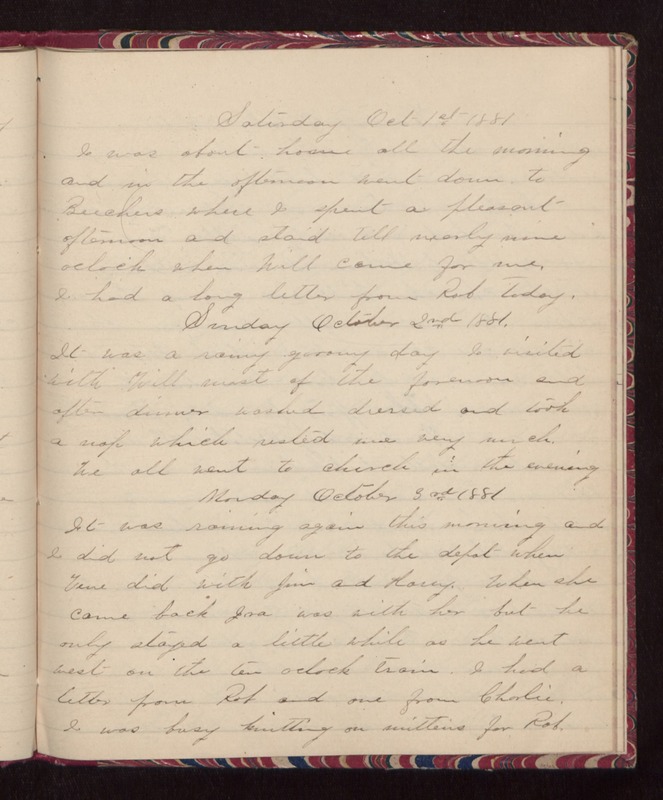 We all went to church in the evening Monday October 3rd 1881 It was raining again this morning and I did not go down to the depot when Vene did with Jim and Harry. When she came back Ira was with her but he only stayed a little while as he went west on the ten oclock train. I had a letter from Rob and one from Charlie. I was busy knitting on mittens for Rob.